People participate in a rally April 8, 2015, to protest the death of Walter Scott, who was shot and killed by a police officer as he ran away following a traffic stop in North Charleston, S.C. The officer who shot Scott, Michael Slager, has been charged with murder. Black Lawyers for Justice wants a special prosecutor to handle a white police officer’s deadly shooting of an unarmed black man in North Charleston, S.C., the Associated Press reports. 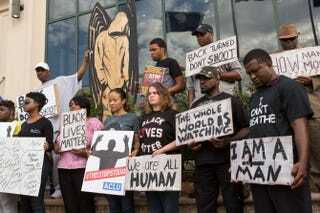 Malik Shabazz, the organization’s president, issued the call Monday during a rally at the North Charleston City Hall. According to AP, Shabazz also said that BLJ will conduct its own investigation of now-former North Charleston Police Officer Michael Slager’s shooting of Walter Scott on April 4. Local authorities immediately arrested Slager and charged him with murder when a video of the shooting appeared. A bystander recorded the incident that shows Slager firing eight times as Scott tried to run away. The officer reportedly lied to his superiors about how the shooting unfolded. The group filed a $40 million lawsuit in the aftermath of the police slaying of Michael Brown in Ferguson, Mo. That suit alleged that local authorities used excessive force and falsely arrested bystanders in the uproar after the fatal shooting. Shabazz said that the outcome of BLJ’s investigation will determine whether the organization files a lawsuit in North Charleston. In the meantime, the group is organizing a nationwide town hall meeting this weekend to discuss race and police practices.